Designing our beautiful wedding invitations was such a fun part of wedding planning! I feel when you create wedding invites, their vibe really sets the scene for the whole day and gives guests an idea of what to expect. Our guest list just included those we are truly closest to and have been a big part of our lives, so we had around 75 people. 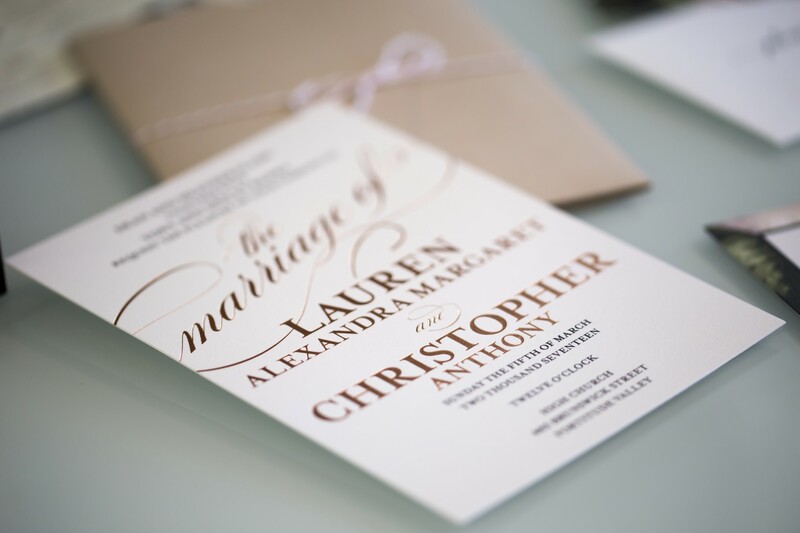 This allowed us to create a beautiful invitation set for each guest. After doing lots of research online, I found Wedding Paper Diva’s and was blown away with how many designs and personalization options they had. This meant that whatever I dreamed up, I could create! 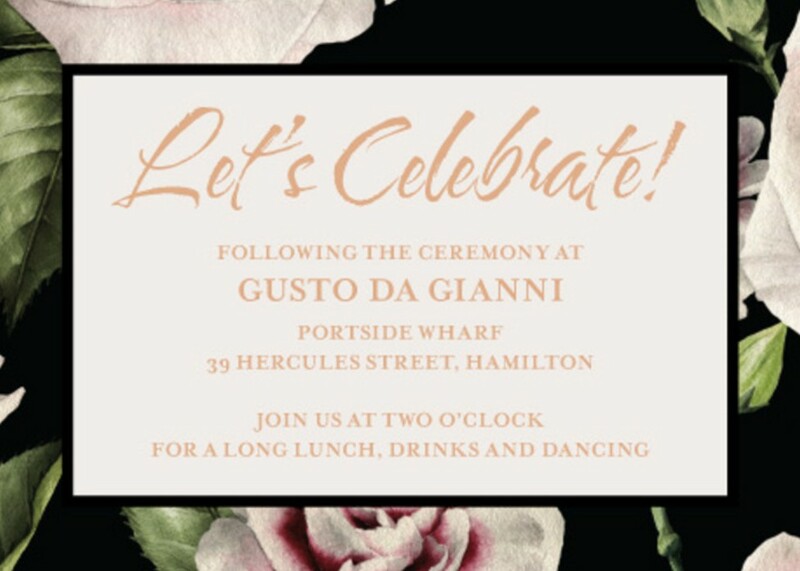 I’ve always loved metallics and neutral tones, so I chose a gorgeous rose gold color font and heavy ivory card stock for our church invitations. I wanted something simple but elegant and pretty. However, not so frilly that it wouldn’t suit Chris. I created the design online and showed Chris the proof, he thought it was fantastic. 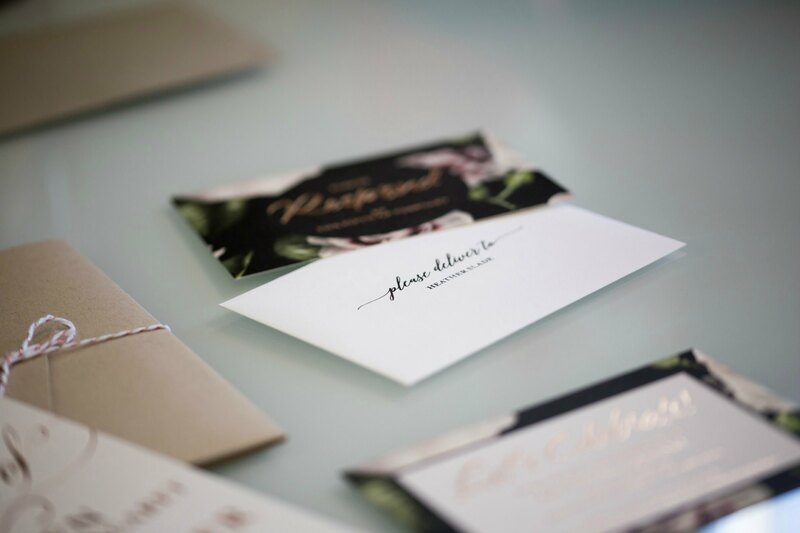 The whole process of finding the perfect invitation to reflect us, personalize it and have it printed was incredibly easy – and importantly, budget friendly. As part of our wedding invite set, we also included a separate card for the reception, along with an RSVP card. 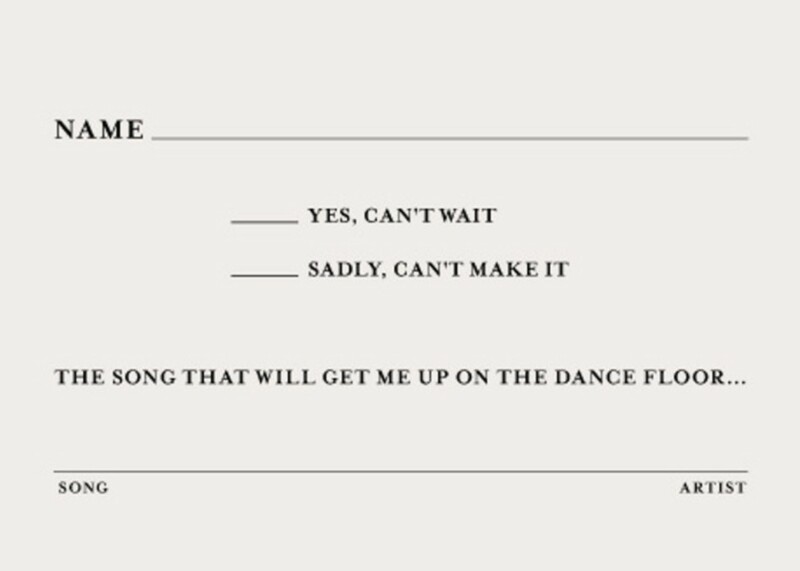 This had a fun option for guests to nominate the song that will get them on the dance floor. Finally, we added a little Details card which had some helpful information for guests and our wedding website with registry information. Side note, I couldn’t find a wedding website design that I liked or a cute URL to give to guests. 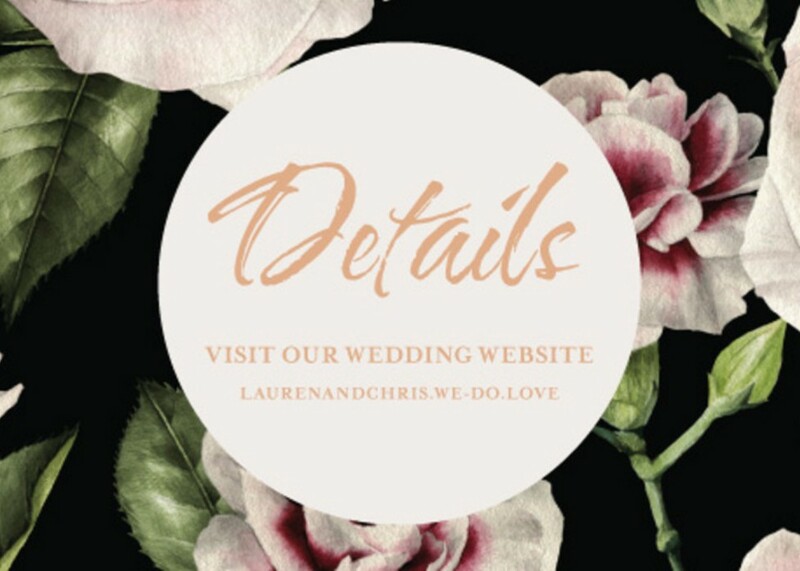 For example, ours was just laurenandchris.we-do.love …how fab is that! You don’t want to put a big clunky one with numbers or a business name. None of the other wedding websites I found had built-in Google maps for directions, or an online registry that allowed us to choose any gift (from anywhere or anything). So I built a wedding website for us with all of this! If you are interested in your own custom wedding website, contact me and I’d love to create one for you too. 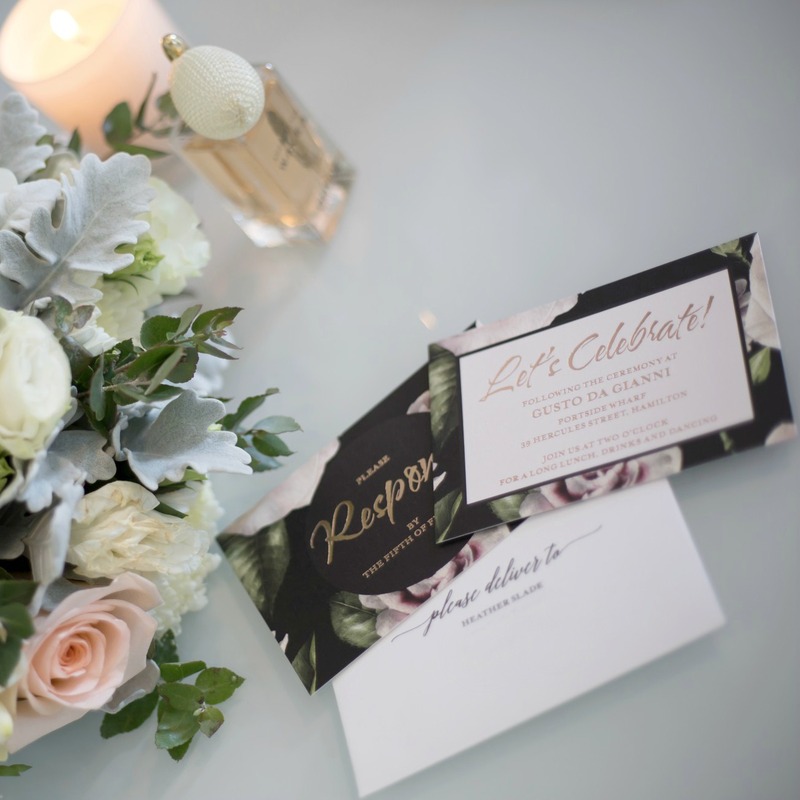 I adored the mix of our crisp ivory wedding invitation and the dark floral and gold of the additional cards. I’m a fan of florals, but sometimes they can be too girly. The black toughened it up a little and gave a very glamorous feel. While the soft pink shades of the floral was very wedding appropriate. I didn’t want any part of my wedding to be a token, typical wedding style. I wanted it to of course reflect a wedding, but be more what you would expect for a fabulous event. We complete our wedding invitation set with a kraft card envelope, it was the perfect juxtaposition of high end glam and something a little more rustic. I tied them with Rose Gold Bakers Twine that I found on Amazon and each invitation was finished with a pretty bow at the front. I once read an interview from a celebrity event planner and they said creating an amazing experience and styling vibe for an event is all about mixing unexpected elements. I’ve always believed this even with fashion and outfit ideas, for example mixing sequins and denim. The best looks combine different vibes! I adore our wedding invites and was so thrilled with them in real life. The quality of design, card stock and printing was impeccable! When our wedding invitation delivery arrived, I couldn’t have been more excited or happy. With anything you put your name to in life, you want to feel proud and both Chris and myself, along with our parents, were genuinely excited to send these to the most special people in our lives. What do you think of our wedding invitation set? I’d love to hear from YOU, my friend! 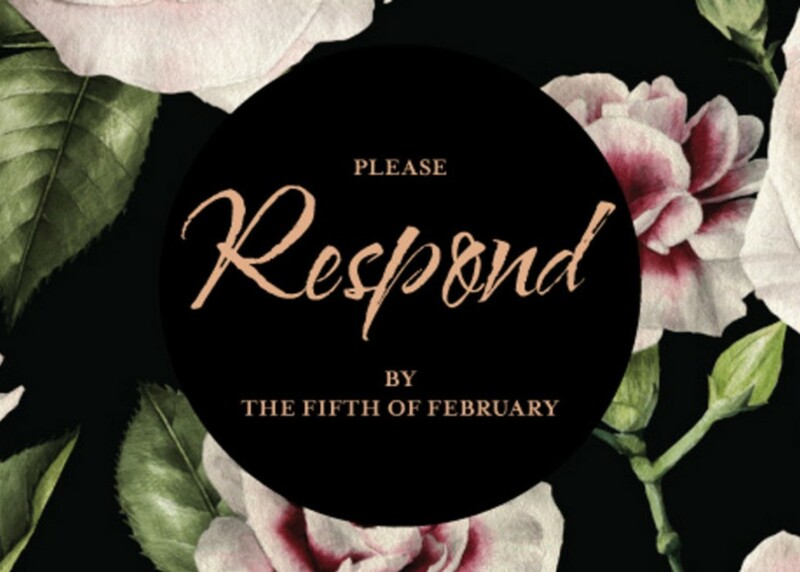 What invitation vibe and colors did you (or would you) choose for your wedding? Leave a comment below and let’s chat. The invitations are just perfect. Have a great weekend Lauren. These invitations are so so beautiful! When I got married there was no internet, ha ha, so no fun options like this..you did a fine job on them! I love the dark floral design, so beautiful.